New to my N8, but was a N5 and brief N7 owner. I used to love using S Notes, now it appears we have the Samsung Note app. I figured out how to change handwritten sentences that are already written in the note to text - that was easy. But I don't see a way to use the handwriting-to-text functionality to actually enter text in a note. Did I stump everyone with this one? You can select the keyboard (upper left corner) rather than the pen, then when the keyboard opens use the write to text feature from there. That's seems the easiest way for me. By "write to text" do you mean the "extract text" function that you use after the fact, once you've handwritten content into the note? Or are you talking about the real-time feature that I can access outside of the Note app, where my handwriting is recognized and translating as I write? That's what I can't find at the moment. Yes I mean handwriting recognition. Once you bring up the keyboard you have to select the write to text function. Excuse my handwriting, it's horrible. I use GBoard, that's why I didn't see this. Maybe I need to drop back to Sammy's keyboard. Haha, you did! I don't normally have the "Direct Pen Input" option on, but when I tried it last night, I could only use it pretty much in any text input field outside of both Samsung Notes AND S Note (I have that installed as well). Yet I remember using it on my earlier Note phones and tablets. If you didn't post that mhunter, I would have not figured out why it wasn't working. Now I know what I didn't know that I didn't know When I saw your pic, I saw that you're using the Samsung keyboard. I've been using SwiftKey for the past few years, which of course does not show the option on the keyboard. Yeah I didn't really consider non-samsung keyboards when I replied. I stick with the stock one even though there are some better ones out there. But can't you switch the keyboard on the fly when using a notes app? ... But can't you switch the keyboard on the fly when using a notes app? Yep, you can. I hadn't used "Direct Pen Input" in so many years that I had forgotten all about it til this thread. And if you hadn't shown that pic, I would have just forgotten about it again, lol, when I didn't get the little text icon. Thank you both! With the Sammy keyboard, it works a trick. I need to investigate what Direct Pen Input is. The N8 is freakin' amazing! Also, for 8 owners like me that want handwriting recognition in the Samsung Notes app, you can select "Pen Detection" in the Samsung keyboard settings, and the handwriting panel will be the default for text input. Nice! 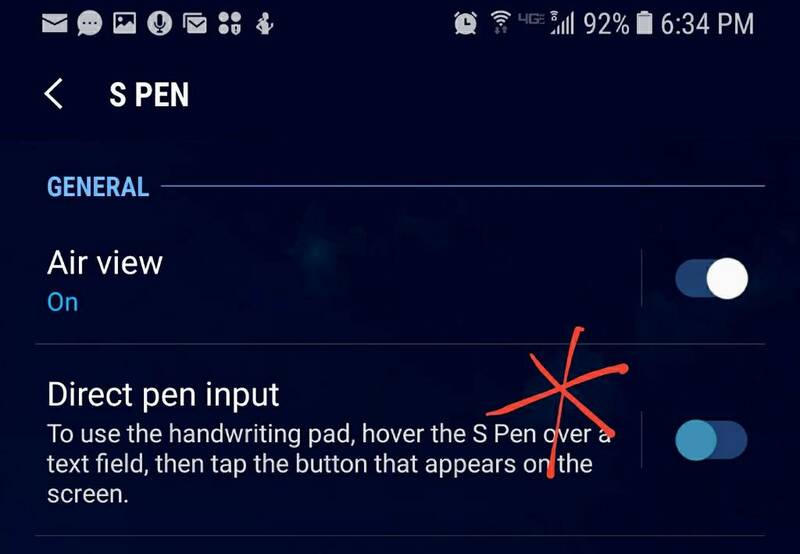 It's the S Pen feature (see settings pic) that allows you to use the handwriting to text option in general. It might have been turned on by default, and I likely turned it off. I just hover my pen over a text box. It's not very accurate anyway so I hardly ever use hand writing input. If I have time to play I will. Unless of course yall are talking about something else & I'm confused. Lol. Yes - that works well. I was talking about how to get to the handwriting recognition when in the Notes app. Hovering over the text field in that case doesn't work if you are using Google's GBoard. I tried to use Sammy's keyboard, but I am such an old school Google keyboard user, that I had to switch back. Now, I just switch over to Sammy's keyboard if I need that function. There's a cool little icon on the nav doc (lower right corner) to facilitate that. 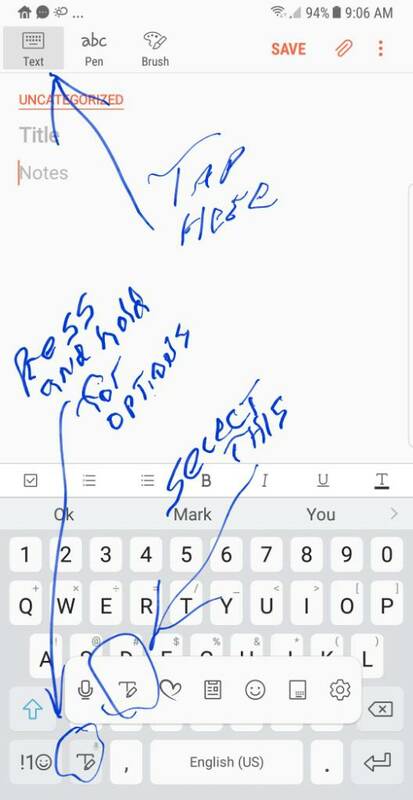 If I may revisit this a year later, I now see how to use the Samsung keyboard to enter a note w/ pen and how to use Samsung Note to scribble a handwritten note, but is there a way to try to recognize the text of my handwritten note (i.e. add text or replace the handwriting with text)(text as in something I can copy/paste into an app that expects text) after the fact?? Thank you. If you use Samsung Notes to write out your notes, if you edit the note, go to Pen, the toolbar that appears has "Selection mode". Draw a rectangle around whatever you want to copy, and one of the options that pops up is "Extract Text". I use it all the time to extract my handwritten notes for work into Microsoft OneNote for easier searching. Sometimes it doesn't recognize symbols or adds things that aren't there (probably due to poor handwriting) but for the most part, it works. Is the Note 8 4k display? note 8 low speaker volume?